The Syrian government’s crackdown on opposition, as well as attacks by anti-regime forces, continued across the Middle Eastern country last week. Meanwhile, Washington and the European powers stepped up their campaign to oust the Baath Party government through efforts in the United Nations and talks with the Syrian opposition. Opposition groups claim that the bodies of 30 people killed by security forces were found in the city of Homs on December 5, and another 3 people were killed by gunfire on Saturday. The Syrian army has established more than 60 checkpoints inside and around the city, according to a Turkish-based opposition group, the Syrian National Council (SNC). 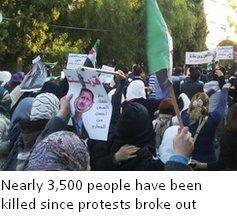 Homs has been at the centre of fighting between Syrian security forces and opponents of the regime. Scores of people have been killed in the city since the outbreak of civil conflict in January. A major armed confrontation between Syrian troops and army defectors occurred Sunday in the southern town of Busra al-Harir, near the Jordanian border. According to Reuters, residents claimed the defectors had been hiding in the area and attacking military supply lines, provoking the assault by forces loyal to the government. 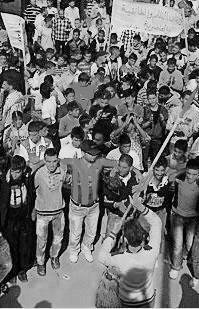 Eighteen people were killed across Syria in clashes on Sunday, according to an opposition group. A national “dignity strike” to protest the government crackdown, planned for Sunday, the first day of the work week, did not result in significant disruptions in Damascus and Aleppo, the two major cities, according to media reports. In some regions, the strike call apparently had an impact. Human rights groups alleged that the Syrian military and militiamen loyal to Assad broke up the strike in the southern city of Daraa. Due to severe reporting restrictions inside Syria, little independent information is available on casualties. The Syrian government claims that armed opposition fighters have killed around 2,000 security personnel this year, while various opposition groups and the United Nations claim that a total of 4,000 people have died in security crackdowns. Homs is also a centre of oil production for Syria. Anti-government forces apparently blew up a major pipeline bringing oil to the refinery near the city Thursday. One of only two refineries in Syria, the Homs facility can process more than 130,000 barrels per day, nearly half of the country’s capacity. It is unclear if the refinery is still in operation. The official Syrian news agency called the pipeline attack a “terrorist sabotage operation.” Syria’s total oil production, a major source of revenue, has fallen from 340,000 barrels per day in February to around 120,000 today. The European Union, the country’s main energy export market, no longer purchases Syrian oil. Located just a few miles from the Lebanese border, there are signs that Homs has become an entry point for arms and opposition supporters coming into the country. The Syrian government claims to have intercepted weapons and funds being smuggled across the border to support armed opposition forces. There have also been reports in the Lebanese press of exchanges of gunfire across the border between Lebanon-based armed groups and the Syrian army. He also stressed that the SNC, which was only established in October with the backing of Turkey and the Western powers, was seeking diplomatic recognition, in the same way that the Transitional National Council (TNC) in Libya was offered diplomatic and financial support during the NATO-led operation to oust Muammar Gaddafi. 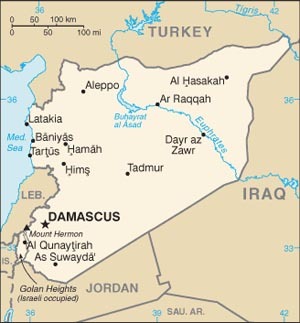 Any regime brought to power in Damascus on such a basis, as with the TNC in Libya, would be a staunchly pro-capitalist pawn of the major powers, wholly unreceptive to the democratic and social demands of the Syrian masses, who oppose the conditions of poverty and social inequality in Syria as well as the Assad regime’s brutality. As in Libya, Washington and the European powers are utilizing a civil conflict in an attempt to replace a regime that it views as something of an impediment to their predatory interests in the energy-rich region. The US government and its European allies have repeatedly pressured the United Nations to pass condemnations of the government of President Bashar Assad. However, Security Council permanent members Russia and China, which have close economic and strategic ties to Syria, have refused to sign on to Washington’s destabilization campaign. Last month, Beijing and Moscow vetoed a Security Council resolution, drafted by Britain and France that would have imposed sanctions on Syria. At a meeting on Friday, the Security Council agreed to a French request for a discussion of events in Syria. The move by Paris was reportedly opposed by Russia, China and Brazil, whose governments fear that, as in the run-up to the NATO war against Libya, Security Council resolutions will be used to justify a US-led campaign of regime change. Russia’s ambassador to the UN, Vitaly Churkin, warned that the Security Council’s consideration of the Syrian situation was “intruding on the affairs of the Human Rights Council,” a less influential UN body that does not have the authority to authorize sanctions against Damascus. However, the US has worked through its regional allies in the Middle East to pressure Damascus and sponsor anti-Assad groups engaged in fighting inside Syria. The only Middle Eastern member of the US-led NATO military alliance, Turkey is acting as the main ally of Washington in the confrontation with Syria. The Turkish government hosts the two main Syrian opposition groups, the SNC and the Free Syrian Army, and has moved thousands of extra troops to its border with Syria. On Friday, there were reports of heavy exchanges of gunfire along the 560-mile Turkish-Syrian border. The Syrian government claims that anti-regime fighters and weapons are coming into the country from Turkey, while Ankara has accused Syrian border guards of indiscriminately firing upon people on the Turkish side of the frontier. The Turkish regime warned Syria on Friday that it would take further action to prevent a flood of refugees coming into its territory, in effect a threat to directly intervene into the Syrian civil conflict. Turkish foreign minister Ahmet Davutoglu refused to state what action Ankara would take. “Turkey has no desire to interfere in anyone’s internal affairs. But if a risk to regional security arises then we do not have the luxury of standing by,” Davutoglu told reporters. Turkish officials have previously suggested that the country’s armed forces could set up a “safe zone,” enforced by ground troops and aircraft, inside Syria. Purportedly to protect civilians, such a move would be an act of war, giving Turkish forces, backed by the US and NATO, a beachhead from which to topple the Assad regime. Such actions could quickly spiral into a full-scale regional war. Iran is Syria’s main ally and has guaranteed its sovereignty, while the other countries bordering Syria—Lebanon, Israel, Jordan and Iraq—as well as the Persian Gulf monarchies, could easily be drawn into the conflict. In response to the Arab League suspending its membership, Damascus has signalled its willingness to accept international human rights monitors into the country, on the condition that sanctions against the country are lifted. However, even if Damascus allows Arab League inspectors into the country, which many observers consider unlikely, the US-led campaign for regime change will continue, driven by the desire of US and European imperialism to control the vast oil and gas resources of the Middle East and block any genuinely progressive expression of the aspirations of the Syrian population. This entry was posted in News and tagged Damscus, Libya, regime change, Syria, unrest, US. Bookmark the permalink.